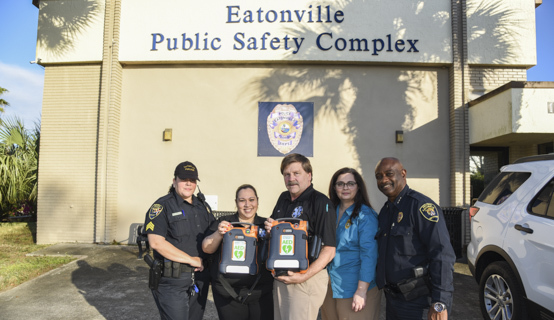 Orange County’s Emergency Medical Services (EMS) Office provided the Town of Eatonville Police Department 12 automated external defibrillators (AED) in January through a grant from the Florida Department of Health EMS Trust Fund. An AED is a device that checks an individual’s heart rhythm when they experience cardiac arrest and then delivers a potentially life-saving electronic shock to restore the individual’s normal heart rhythm. Funding for the award comes from a grant issued by the Florida Department of Health EMS Trust Fund to Orange County’s Emergency Medical Services Office of the Medical Director. In 2016, the office distributed 39 AEDs to local law enforcement departments. Orange County EMS also provides AED and CPR training for law enforcement personnel. Last year alone, EMS Training Coordinator Jessica Monterrey certified 2,600 people in CPR. From that group, 2,483 represented law enforcement personnel. “Research shows that providing law enforcement personnel with refresher CPR courses, along with individualized training on how to use an AED saves lives,” Orange County Paramedic Tom Daniels said. Monterrey said that for every minute delay past the first three minutes following a cardiac arrest, survival rates could decrease by seven to 10 percent. Therefore, it is critical for officers and deputies in the field — those who are often first on the scene — to be current in their CPR and AED training to deliver life-saving treatment with confidence and without hesitation. Through Orange County EMS, CPR classes take anywhere from two to four hours and are offered in partnership with the American Heart Association. Monterrey’s advice to anyone who encounters a person they believe is in cardiac arrest is to ensure the environment is safe and secure; call 911 or have someone call for emergency assistance; keep the phone on speaker; get an AED and push hard and fast in the center of the chest of the individual. Monterrey added that if responder is unsure whether an individual is experiencing full cardiac arrest, it is better to try CPR than to stand by. With Orange County’s pending release of a new free mobile app called “PulsePoint Respond,” subscribers will be able to receive alerts of any nearby cardiac arrest calls. This spring, the Florida Department of Health and partners will attempt to break the Guinness World Book Records for the number of people learning CPR at one time. Orange County EMS is proud to continue creating greater awareness that helps ensure people are more likely to be in a position to save a life. To learn more about CPR and AED training visit, https://www.ocfl.net/EmergencySafety/DefibrillatorProgram.aspx.